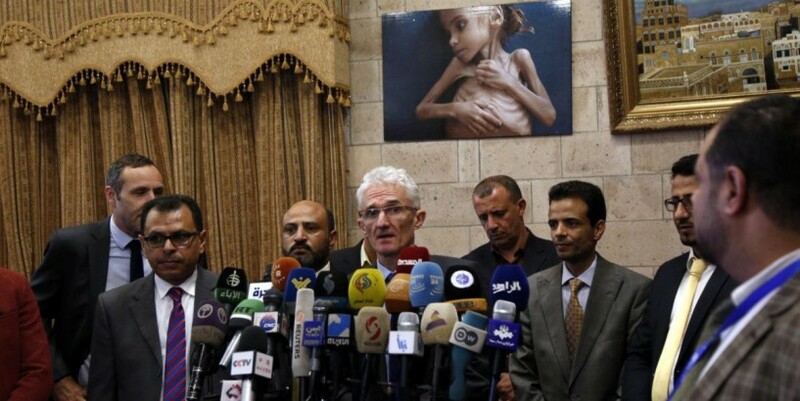 UN urges Houthis to stop blocking access to grain mill February 7, 2019 at 9:55 pm | Published in: International Organisations , Middle East , News , Saudi Arabia , UN , Yemen United Nations Under-Secretary-General for Humanitarian Affairs and emergency relief coordinator Mark Lowcock, speaks during a press conference held on his arrival to Sana'a on 29 November, 2018 in Sana'a, Yemen [Mohammed Hamoud/Getty Images] February 7, 2019 at 9:55 pm The UN urged Yemen’s Houthi rebels Thursday to restore access to a grain storage site at a key port city after nearly a half-year blockade and a worsening famine in the country reports Anadolu Agency . The Red Sea Mills in Yemen’s al-Hudaydah contain enough grain to feed 3.7 million people for a month, but the UN has been unable to access them since September, humanitarian aid chief Mark Lowcock said in a statement. The grain has been left unused for more than four months and could be spoiling, Lowcock said. Just last month the compound, which lies in government-controlled territory, was hit by two mortar rounds resulting in a fire that burned some of the stored food. Nearly 10 million people in Yemen are on the brink of famine. Houthi-affiliated forces known as Ansar Allah have blocked the UN from crossing frontlines to access the mills, the aid chief said. Saudi Arabia has been leading a coalition of countries against the Houthis since 2015 when Riyadh and its Sunni-Arab allies launched a massive air campaign in Yemen aimed at rolling back Houthi gains that began the year prior. The Saudi-led campaign in Yemen has devastated the country’s infrastructure , including its health and sanitation systems, prompting the UN to describe it as one of the worst humanitarian disasters of modern times. Al-Hudaydah is a major lifeline for Yemen’s beleaguered civilian population with significant amounts of humanitarian aid flowing through the port city.